Caritas is appealing for urgent aid to help thousands of people displaced by worsening conflict in the Diffa region of Niger. Caritas Niger (CADEV), the national arm of Caritas, says there have been several deadly attacks by Boko Haram militants recently forcing thousands to flee their homes in Niger and neigbouring Nigeria. With the support of partner organisations around the world, Caritas in the diocese of Maradi, the country’s third largest city, is leading an emergency humanitarian project and providing support to refugees and displaced people fleeing Diffa. According to Caritas, many fled when two people were killed in an attack on a village in Chetimari in July and another was killed in the village of Maridi in Maine’ Soroa. A counter offensive by the multinational Joint Task Force composed of troops from Niger, Nigeria, Cameroon, Chad and Benin in the Diffa region led to further displacement. Funding from several Caritas organisations is being provided to help internally displaced households and restore people’s livelihoods. Caritas is providing financial assistance to 1000 displaced households, 1000 hosts and 500 girls and boys from the Diffa region living in Maine’ Soroa, Diffa and Chetimari. More than 15,250 people are benefiting from the critical aid. With support from partner Caritas organisations in Spain, Japan, South Korea, Denmark, Belgium, Canada and Italy, Caritas Niger has been providing cash transfers as well as shelter kits and household items. Aid contributions have also come from CAFOD and Secours Catholique. Families forced to flee and their hosts are receiving cash transfers. Caritas is also providing 300 displaced households with shelter kits. Mosquito nets, kitchen utensils, blankets and other items are also being provided while 500 young people are receiving training on social cohesion. “The demand for shelter is still very high in the area,” says Illo. There are more than 114, 000 refugees in Niger and 127,000 people internally displaced by the Boko Haram threat. Caritas estimates there are more than 82,500 Nigerian refugees in the Diffa region alone. There are 167,000 internally displaced people plus an additional 31,000 returnees. 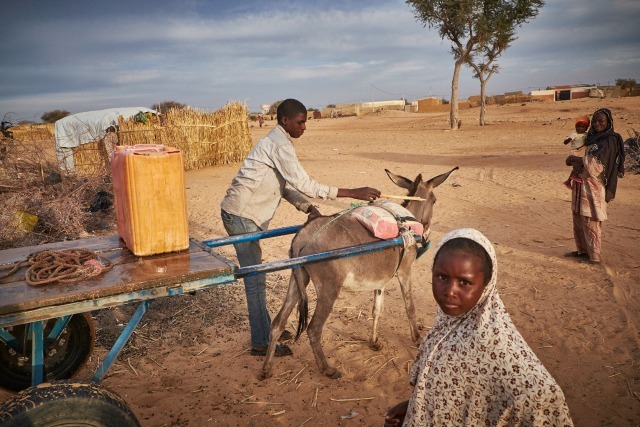 The total number of refugees and internally displaced in Niger is 281,000 people. To help some women to support their families, Caritas has begun a pilot scheme to help 100 women from displaced households generate income. “Our goal is to give hope to the courageous women who, despite the daily difficulties, are trying to give hope to their children who have been forced to leave,” says Illo. “We need to urgently empower women and involve them in humanitarian activities so that they actively participate in community recovery, development and reconstruction. There are more than 16 million people in Niger and about 2.5 million people are estimated to suffer from chronic food insecurity in a country where many rely on agriculture and subsistence farming for their survival.